Right around the time Air Force 1 returned back in the US from Trump's Singapore summit trip, just before 6am EDT, the president tweeted that "everybody can now feel much safer than the day I took office. There is no longer a Nuclear Threat from North Korea." He added that the "meeting with Kim Jong Un was an interesting and very positive experience. North Korea has great potential for the future!" He then followed up by taking aim at his predecessor, tweeting that "President Obama said that North Korea was our biggest and most dangerous problem. No longer - sleep well tonight!" 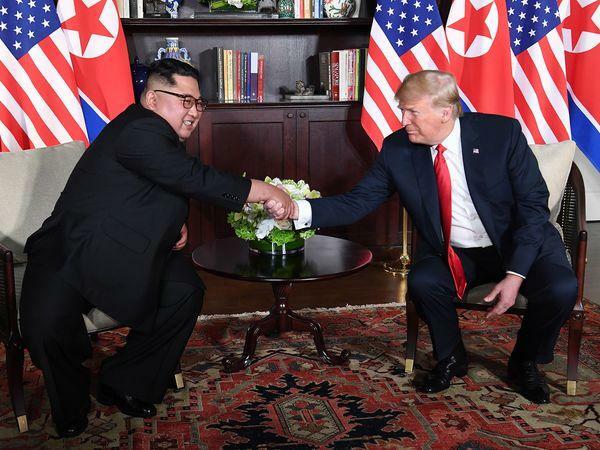 Trump's ongoing victory lap was marred, however, overnight when North Korean state media, KCNA, reported that Kim Jong Un said Donald Trump offered to lift sanctions against his regime when they met Tuesday in Singapore, a claim which contradicts Trump's previous statements that the economic strictures would remain. As Bloomberg notes, the last point was noteworthy since it went further than Trump did in his public comments during and after the meeting. Specifically, while Trump said he would end "war games" with South Korea, the US president said sanctions would stay until the isolated nation moved to give up its nuclear arsenal. Speaking of the end to joint "war games", Trump also tweeted on Wednesday morning that "we save a fortune by not doing war games, as long as we are negotiating in good faith - which both sides are!" Meanwhile there have been slight differences in recent comments among senior U.S. officials as to whether that means North Korea must first complete denuclearization - and have it verified - or if some goodwill steps would be enough. Adding to the potential confusion, KCNA also portrayed Trump as having given in to Kim Jong-un’s “demand” of suspending military drills. While clearly at least part propaganda, the statement could spell trouble for Trump if it is perceived that North Korea now has the upper hand in negotiations with the US. The White House has not yet responded to a Bloomberg request for comment on the KCNA report. Trump several times said there were things he and Kim talked about, and agreed on, that were not contained in the formal document. That included the U.S. decision to halt its drills, although it’s unclear which ones and for how long. Trump added that Kim told him separately that North Korea had dismantled a missile engine test site. So if any promises were made on sanctions, they were not made publicly. Meanwhile, Trump faces Japanese pressure to keep sanctions in place, and a push by China to lift them. A Chinese official already signaled the country may ask the United Nations to lift or adjust the penalties, the basis for the “maximum pressure” campaign Trump has used to push Kim toward disarmament. China, as North Korea’s neighbor and most important trading partner, also could provide relief to Kim by throttling down sanctions enforcement on its own. The main crossing point from China into North Korea is the city of Dandong. About 80 percent of North Korea’s international trade is with China, much of it through the frontier city filled with shopkeepers, smugglers and real-estate dealers whose fortunes rise and fall with the trade across the Yalu River. The real question will be whether N. Korea suddenly feels empowered to boast about having "triumphed" over Trump, and now feels comfortable enough to declare that it is setting the tone of negotiations. If that is indeed the case, even with Chinese support, it is unlikely that Trump will play along too long, and there is the all too real risk that all the goodwill that was built up on Tuesday evaporates with just one angry Trump tweet as we revert back to square one.